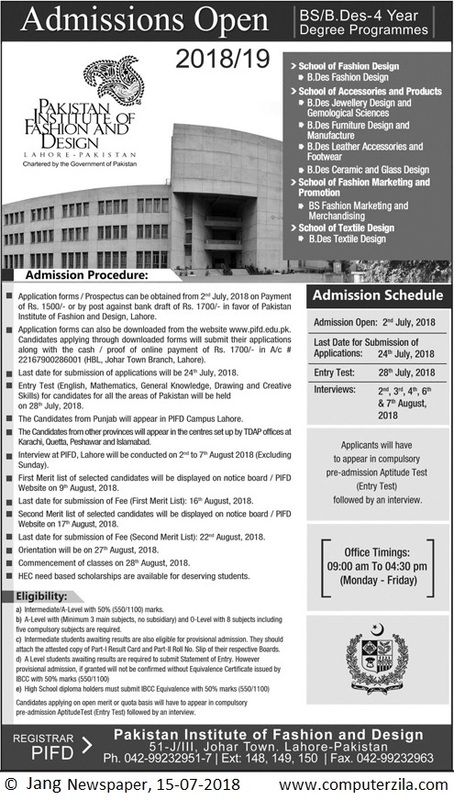 Admissions Open at Pakistan Institute of Fashion and Design's Main Campus, Lahore for the batch Fall 2018. PIFD offers admissions in different fields of study for Bachelor Programs. Admissions open for 4 year BS and B.Des Degree Programmes. applicants will have to appear in compulsory pre-admissions aptitude test (Entry Test) followed by an interview. Bachelors EligibilityIntermediate or A-Level with atleast 50% marks, High School diploma holders must submit IBCC Equivalence with 50% marks.